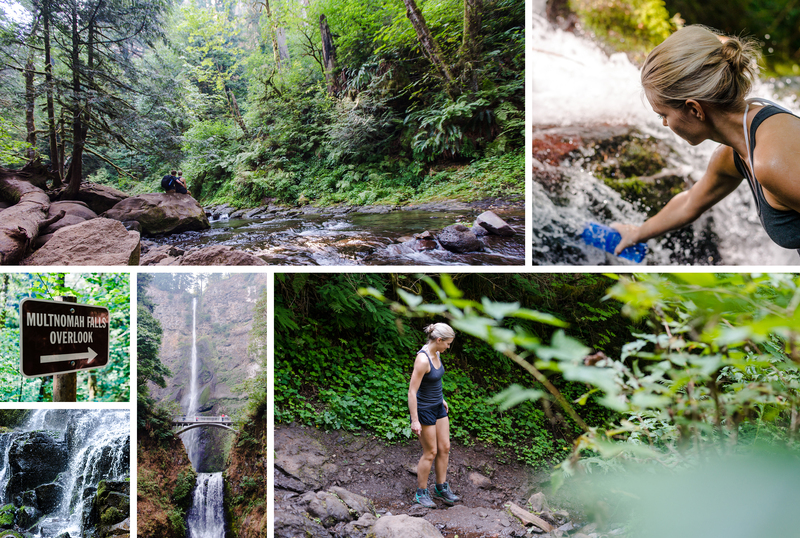 A short distance from Portland lies some of the most luscious greenery and hidden waterfalls you could want to step away and experience. Bob and I found that it’s so easy to get lost – in the best way. Lost on the trails, enjoying nature, snapping photos, with no sound aside from soft footfall and rushing water. I started the day by dressing in a bikini and athletic clothes, with brand new hikers on, intending to tackle a series of challenges. We packed a lunch and hit the road, venturing just beyond Portland’s bounds, to Multnomah falls. Now, I had been here many times previously, but as renowned as it is, I knew we had to go there. I’ll admit, I was antsy. We took photos, ascended to the bridge a short distance up the path, and ventured a few miles up to the top to take it all in. We battled a little bit of smoke clouding the Columbia River Gorge due to forest fires. 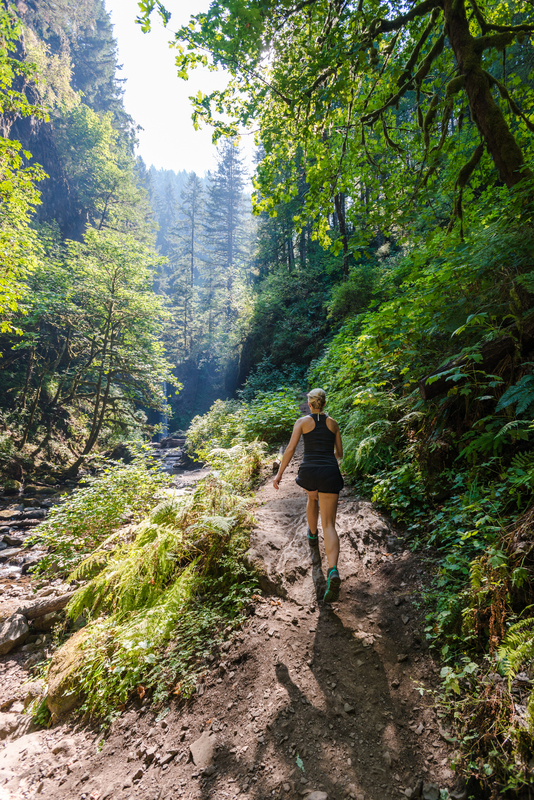 During this time, I had one focus – getting to Oneonta Gorge. Despite this, we decided to take the advice of a friendly hiker we encountered and take the back trail leading from Multnomah to Wahkeena Falls. Incredible. Each turn surprised us with a rocky ridge, small falls, or one particularly enchanting waterfall possibly more stunning than Wahkeena itself. We never did find the name of that one, but enjoyed its refreshing mist. We pressed forward for an hour or so, drank from Wahkeena Falls’ icy waters, and concluded our hike. Finally, time for my big thrill. 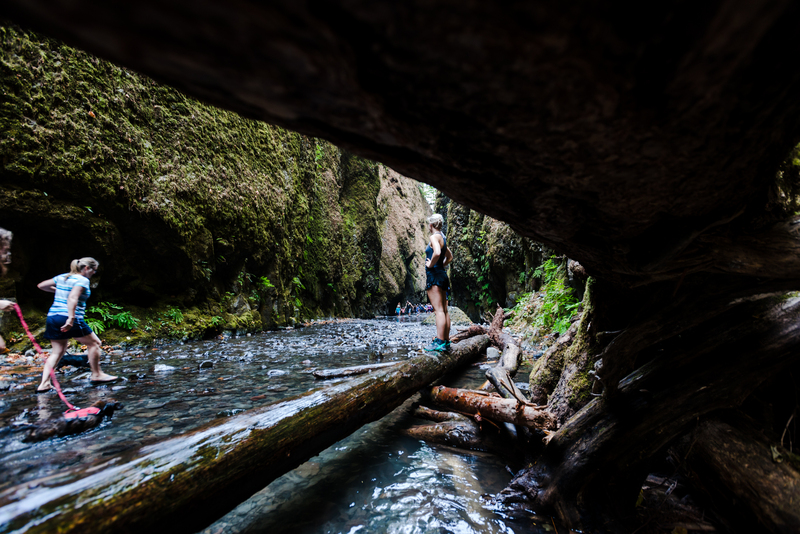 Oneonta Gorge, known for it’s limited access, deep waters, and rewarding waterfall at the end of a tough scramble. It was the reason I bought hiking boots. We drove a few short miles alongside the Columbia River Gorge, and came to the sign for Oneonta. A new adventure to take on together! I knew we would wade through water during this little hike, and really couldn’t wait to get my feet wet. 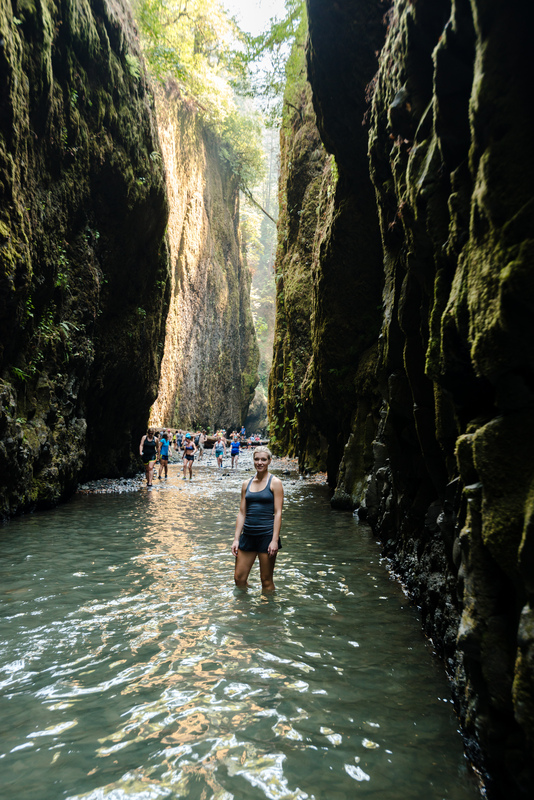 Oneonta Gorge extended a fair ways, beginning with a shallow basin, substantial dam of thick logs, and leading to a sunken pass filled with water. We enjoyed clamoring over the dam, wading through that slippery pass, and the lead up to a swimming hole fed by a rushing waterfall. The gorge itself sunk into the mountainside, and each wall held sweeping moss and greenery which brought some beautiful color to an otherwise singular view of the white waterfall in the distance. We were chilled from our wading, and after a few brief photos, we turned to head back. No swimming for me that day! Looking back, I’m so glad we took in everything the trails surrounding Multnomah had to offer. We purposely found ourselves unhurried, lost in those pathways, and loving it. Often, the best adventures are unplanned. In that moment, we had everything we needed. We enjoyed the rest of the day at Hood River, a small town nearby. 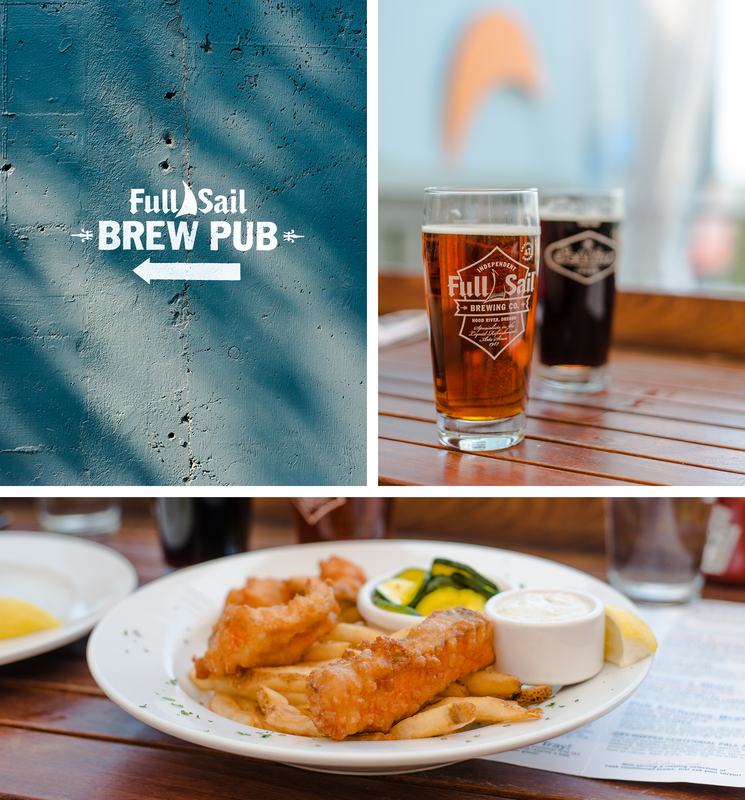 Unsure what to do, as it seems the whole town is a little sleepy on a Tuesday, we found ourselves at Full Sail Brewery, which was great. I’m slowly easing myself into the beer scene, and Bob helped me navigate their menu. We decided on some less hoppy beer to share, and ate a bit of fish and chips too. It was a satisfying snack after our unplanned extended hike in 100 degree weather. Beers finished, we headed home to Lake Oswego to rest our tired legs, and enjoy the rest of our evening spent with family.